Home > Articles > What are Market Neutral Strategies? Investors allocate across geographies, style boxes and market cap spectrums to diversify portfolios, but market crises offer a painful reminder: severe downturns are nearly impossible to escape. When stocks experience a broad sell-off, most asset classes and investment strategies suffer in tandem. In reality, few investments are untethered to the stock market’s directional trends. Market neutral funds are one of the only strategies that can stake this claim. The following shares the basics on market neutral funds, including what they are, the unique portfolio structure that unbinds them from market movements, the benefits of holding these strategies within a portfolio and why the current investment environment may underscore their need. 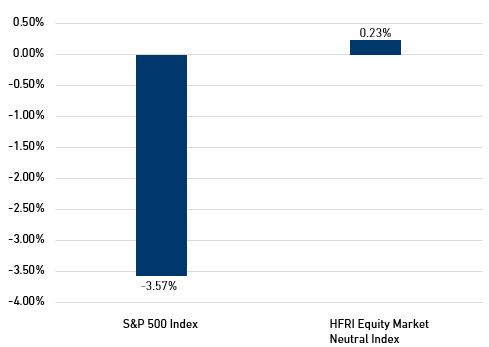 Market neutral funds take a relatively equal weighting in long and short positions. That balanced positioning offsets the fund’s exposure to the market’s directional trends. If stocks rise broadly, gains in the long positions offset losses in the short positions. More important, if the market falls steeply, gains in the short positions offset losses in the long holdings. With broad market exposure muted, a market neutral fund’s performance comes down to the spread earned between long and short positions. Put simply: the manager is rewarded for their skill in identifying specific stocks poised to rise and fall, but not punished when all stocks sell off. For example, an investment manager might believe that over time, stocks with low price-to-earnings (P/E) ratios will outperform stocks with high P/E ratios. In this scenario, the investment manager would buy the top decile of S&P 500 stocks with the lowest P/Es and short the 50 stocks with the highest P/Es. As long as low P/E stocks outperform high P/E stocks, the investor earns a spread from the performance difference between the two groups. In this instance, it doesn’t matter if the stock market is going up or down as the investor has similar exposure to both sides of the market. This indifference to market movements is where the term market neutral was born. The market neutral category encompasses a wide range of strategies including merger arbitrage strategies, which focus on the stocks of two potentially merging companies, or event-driven strategies, which seek to capitalize on a company-specific event such as a bankruptcy or spinoff. Market neutral strategies also focus on various asset classes. This piece focuses on equity market neutral funds, which is the most common market neutral strategy. We group any fund with relatively equal long and short equity exposure—ranging from 30% greater short exposure to a 30% greater long exposure—within the equity market neutral classification. Such strategies can be a valuable complement to other equity funds in a client portfolio, particularly in turbulent market environments. Traditional equity allocations leave the average investor less diversified than they might hope. As the chart below shows, most equity segments are highly correlated. Asset classes such as fixed income have low correlations to equities and help diversify a portfolio, but bonds also offer lower returns. Allocating to market neutral strategies adds another asset to the portfolio that is uncorrelated to equities, without sacrificing the portfolio’s total return potential. Market neutral strategies’ most unique characteristic is the ability to detach from broad market swings. Naturally, this feature is most appreciated in sharp equity market downturns. 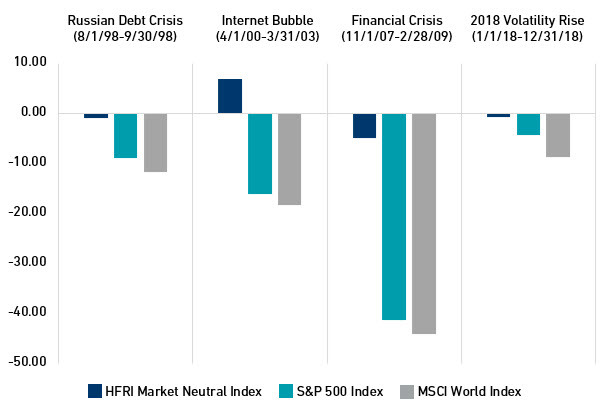 The following chart shows how market neutral strategies have held up relative to various equity indices during four of the worst market events from the last quarter century. An investor holding the market neutral fund would undoubtedly appreciate its stability amid such tumult. While market neutral strategies deserve attention for their performance in the worst market environments, the general steadiness of returns is also notable. As the first table below shows, the market neutral category has experienced a lower maximum drawdown than nearly any asset class or alternative strategy. It has also experienced fewer months of negative returns than most asset classes. The second table below, meanwhile, shows the average return of market neutral strategies in the months when the S&P 500 Index fell. Source: Morningstar. Data from 1/1/1990-12/31/18. During periods of rising volatility, investors are reminded that the only certainty about future market direction is uncertainty. Stocks sold off in October (2018), dipped again in December, then enjoyed their strongest January (2019) in 30 years. Whipsawing markets have alternately punished and rewarded both long-only strategies that benefit from a broad rise in stocks and alternative strategies that capitalize on market declines. The issues sparking volatility—trade tensions, uneven global growth and Fed policy uncertainty—are long term in nature and could continue to grip markets. Against that backdrop, investors may benefit from strategies whose performance is wholly independent of broader market swings. Allocating to market neutral strategies adds another asset to the portfolio that is uncorrelated to equity markets, without sacrificing the portfolio’s total return potential. The market neutral category has experienced a lower maximum drawdown than nearly any asset class or alternative strategy. It has also experienced fewer months of negative returns than most asset classes. Should volatility in the market increase, investors may benefit from strategies whose performance is wholly independent of broader market swings.